Keith and Helen’s olive oil wins top prize! We woke up to the news that our friends’ organic Tuscan olive oil won First Prize last night at the local Tuscan competition! The judges got it right–the oil we brought back last week is exceptional. 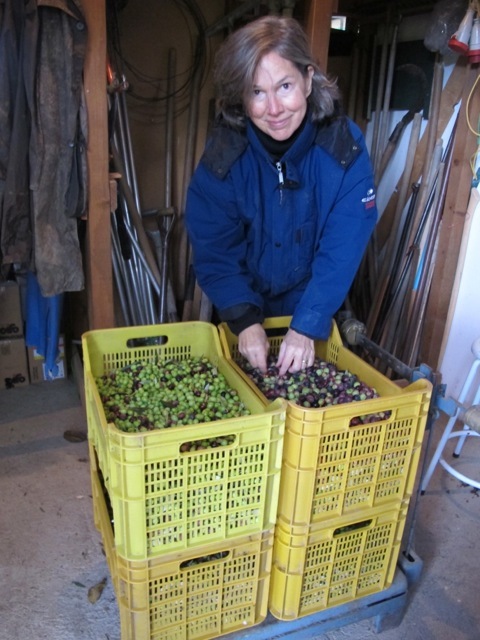 We arrived at Boggioli this year, as last, in a rainstorm that disrupted the olive picking process. 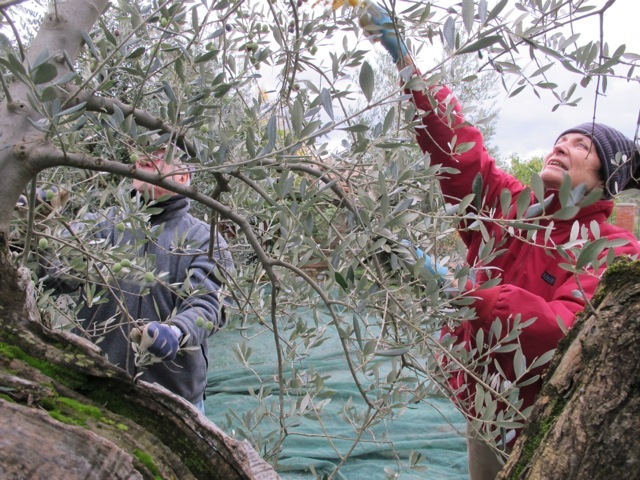 Our usual contribution to the work–gathering the olives into the plastic paniers and pulling out any twigs and small branches that have fallen in–was minimal–limited this year to one afternoon. The torrential rain had made it impossible for the five-man team of professional pickers to work. This left Keith with a problem: He had booked a visit to the frantoio (oil processing plant) but only had a small quantity of olives waiting to be transported from the previous day’s limited picking. 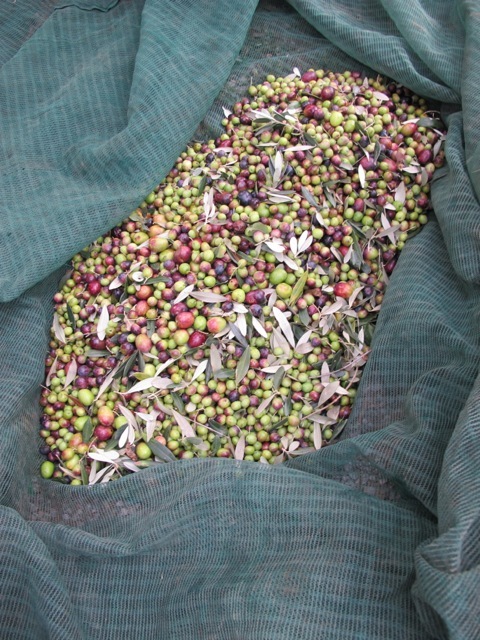 Olives begin to degrade fast and waiting more than two days might affect the overall quality of this year’s yield. So to make up the quantity a little, Keith, Helen, Meredith and I picked some trees nearest to the house where the ground is flat and relatively dry. Pas grand choses but it was fun and made more sense of the next morning’s trip to the frantoio. The health benefits of extra virgin olive oil are well known–and Tuscan oils are especially highly prized. Keith and Helen’s dedication to the cause has been justly rewarded. We sped home last week with our precious cargo on board–highly prized now in more senses than one! Looks like you are both on to a winner here!! – hope the infections are receding. Thanks, Robin. Looks like you and Meredith had a fun and productive visit. It’s good to know of a trusted brand. I always use olive oil. Anyone know if you buy the genuine article in the UK.? You can buy direct from Keith and Helen at Boggioli: http://www.boggioli.com/. I love the photo of the gathered olives. The different shades and the leaves. I would put a print of it on my dining room wall. Congratulations! 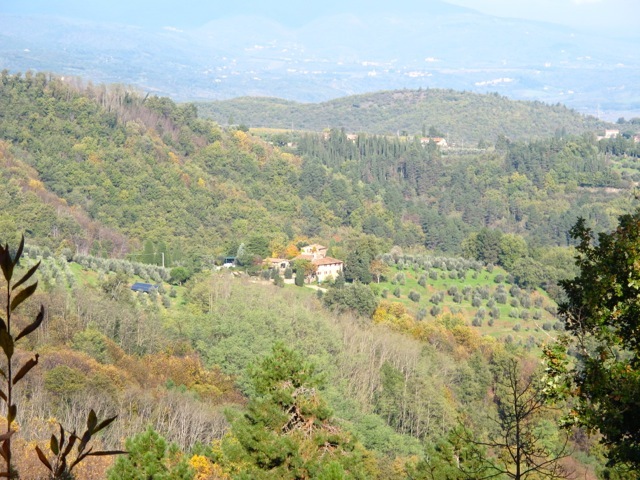 Despite the weather you must have had a great time in Tuscany last November. I remember those days it was raining heavily in Rome as well. 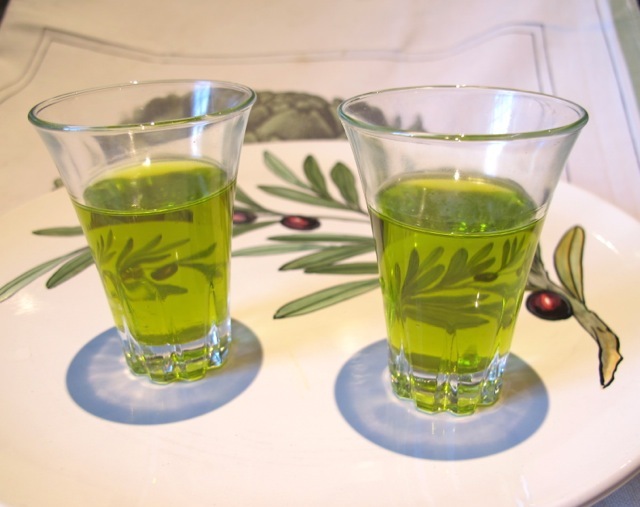 I am now looking forward to receive my very special and personal Christmas gift from my parents…a quantity of olive oil yearly produced by their friends in Sabina, in the Roman countryside. But I am getting curious about the Tuscan oil produced by your friends..
Paola–why not order some and compare!